I make sweet things – and sometimes I share the recipes. So you made it through the last chocolate post, but now you’re wondering, “what kind of chocolate should I use, if not chocolate chips?” When I say don’t use chocolate chips, I mean tollhouse, etc – meant for cookie making. You can use Pistoles – which are the flat round, or sometimes oblong, pieces of temper chocolate. They melt nicely (you can use these in cookies, but the melt – so your choice). For truffle making, look for couverture. Whole Foods – often has valrhona – which is expensive but very good, and has a nice working texture for all types of chocolate making. They make milk, and white chocolate as well, but I wouldn’t bother for the price. Whole Foods also sometimes has Cocao Barry / Callebaut – but the one they get tends to be thick for truffle making. Valrhona – it’s hard to tell unless you have the whole wholesale block, but in my experience Guanaja and Manjari are good as is for moulds, and dipping, as well as fillings. Fleur de cao is higher fat (cocoa butter fat) – which means it is more fluid – so it gets more filled in little droplet logos, compared to mi amere. 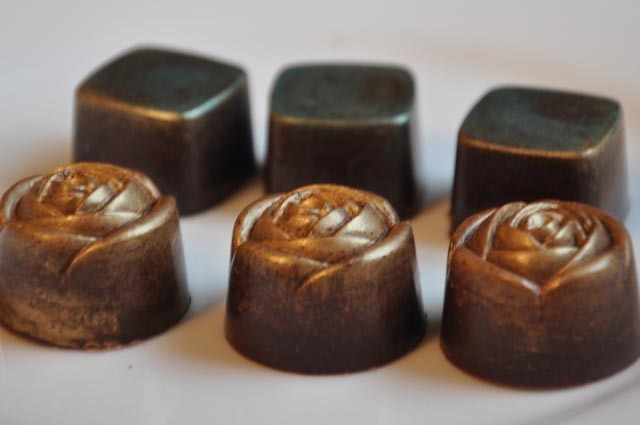 Generally you want 3 or 4 drops filled in for moulds and dipping, 5 is ok for loose fillings (and things like cakes, tarts, ice cream, chocolate mousse, and decoration) and lower than 3 is ok for baking, but will feel very stiff and goopey when working with it on truffles (without adding auxiliary cocoa butter). 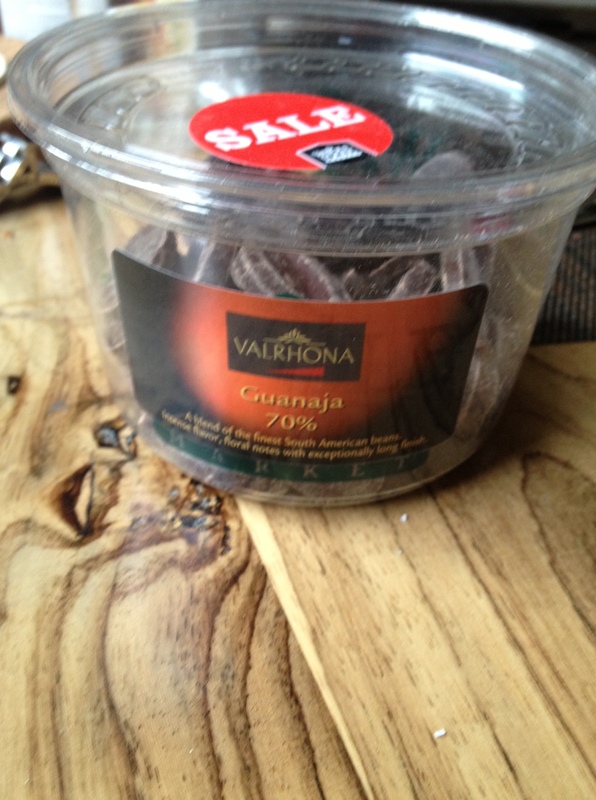 Cocoa Barry now has single origin – which I don’t usually bother with for truffles (except that the Valrhona’s I like are single origin… so maybe if I could buy smaller quantities of the Cocoa Barry ones I would use them). 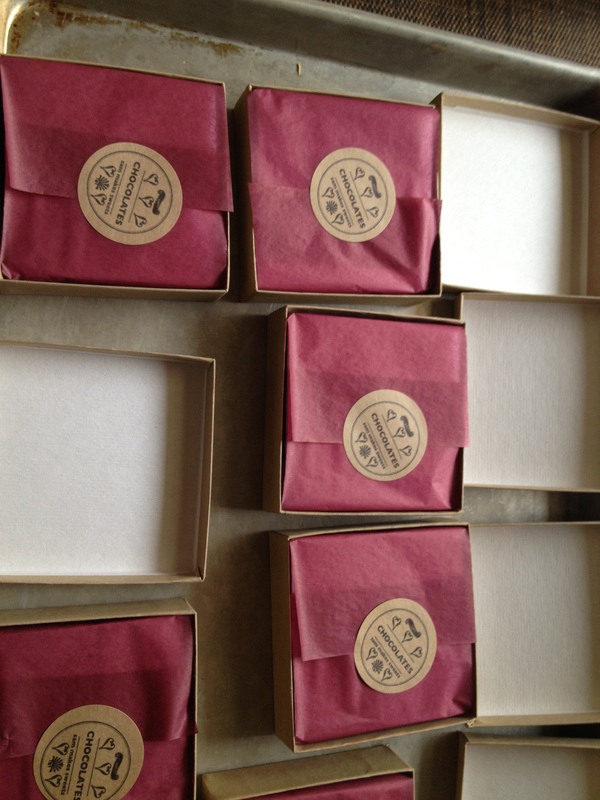 Can you use small production chocolate, like cacao prieto, mast brothers, taza, etc? Yes – but most of them don’t add cocoa butter – so you get what is in the bean which can vary greatly from batch to batch. So I wouldn’t start out learning on this, since you may need to add cocoa butter to get the right consistency. Store you tempered chocolate in a dark container, in a cool place without a lot of light – NOT THE FRIDGE – unless you live in Florida – then I can forgive the fridge. Store truffles in a similar manner – dark, cool, but not the fridge. If you must keep chocolate in the fridge wrap it well, and let it come to room temperature in the wrapping to avoid condensation on the chocolate (this goes for cakes and other pastries too). I store my truffles in a wine fridge that I’ve evicted some wine from.